Les Miserables is the tear jerking update to the classic musical based off the novel with the same name by Victor Hugo. It is also Tom Hooper’s follow up to his best picture winning King’s Speech, so it is safe to say that this film had some high expectations, and it mostly lives up to them. 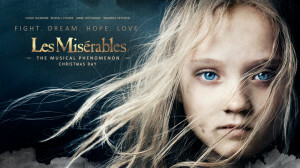 Most people know the story by now, but as a refresher: The movie is about Jean Valjean (Hugh Jackman) trying to redeem himself for past sins, while taking care of Fantine’s (Anne Hathaway) child because he accidently put Fantine on the street, and dodging the unforgiving and obsessed law, Javert (Russell Crowe), and as a spoiler: They are all sad. Tom Hooper does a great job directing this film. Every frame is steady and in place, and allowing the actors to record the songs while acting on set gives the film more life, and bridges the gap from to the stage to the screen. This film is quite a change from the King’s Speech, but he nails it. Hugh Jackman and Anne Hathaway are tremendous in this film. Their previous work in musicals really pays off, and the emotion they carry through song is amazing. The rest of the cast for the most part are very good as well, with one notable exception. Russell Crowe almost ruins this film. He can’t sing, and I am not sure that he is obsessed. He mostly just seems annoyed whenever he sees Jean Valjean like “oh yeah I hate that guy”. Since everyone else is great it is a shame that they didn’t cast someone better. I love Russell Crowe and applaud his willingness to try new things, but they should have found someone else. This is a good movie and one that should be seen, but with a simple casting change it would have been a classic. Tom Hooper is really proving himself to be one of the great directors and I can’t wait to see what he does next, and I am calling it for Anne Hathaway, she deserves that shiny bald dude. Les Mis looked and was shot like a movie, but it was acted (or rather, performed) like a stage musical. To me this confused and muddled the emotions in the film. It became hard for me to take most of the interactions seriously. Interesting take away. I kind of liked that movie via the stage vibe, but like I said in the review, Russell Crowe really held this movie back, and that was a big problem since he had a lot of solos….well like three, but it felt like twelve to many. Next PostNext Django Unchained: the ‘D’ is Silent!